Remove any debris from the lawn if the weather permits, not just leaves, any dog toys, balls and bones that accumulated get buried in the grass when it grow and become a lawn mowing hazard or leave bare patches here and there. By now you will have had your garden tractor, mower, power tools, whatever, serviced of course. Turf levels can be adjusted by peeling back the turf with suitable tools and adding soil underneath to smooth out undulations. Use soil that is similar, check out the type of soil in your borders if you’re not sure. Or you can top dress any depressions but don’t suffocate the grass with too much. You can tidy up lawn edges with a half moon tool or edging shears. 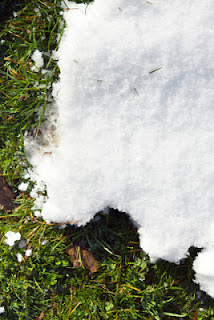 Keep an eye out for any signs of disease in the lawn and treat accordingly – we talked about Fusarium Patch (snow mould) last month and suitable remedies. Watch out for water logging if it’s wet and spike and aerate such areas, filling the holes by brushing in a mix of sharp sand and loam.